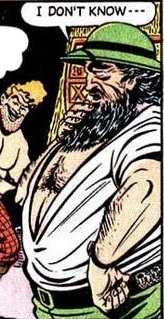 Powers/Abilities: A normal human, the heavyset Jim Derry had no paranormal physical abilities. Although he had once been an honest scientist, Derry apparently suffered a traumatic brain injury that changed his personality. 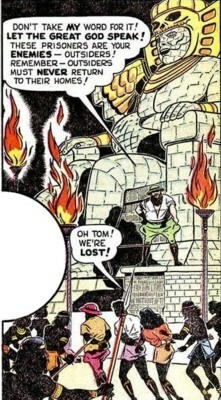 Derry and his henchmen used a statue of the Mayan god Kukulcan in their plot to loot the treasures of the lost city of Apaco. (Namora I#1/1 (fb) - BTS) - The past of Jim Derry is largely unrevealed, but he had once been "a fine scientist" (per Dr. Webber); following an unspecified accident, Derry's mind was warped and he developed a criminally malevolent nature. Derry somehow located the lost city of Apaco, where he pretended to befriend the indigenous descendants of the Mayans living there. But while the natives endeavored to restore their ancestral empire, Derry and his henchmen began to loot the gold and jewels of the city. (Namora I#1/1) - Namora was assisting the archeological expedition of Dr. Webber when she stumbled upon Apaco. Namora entered the city, and as she stood outside one of the temples, she overheard Derry and his men talking about their plot as they plundered the treasures within. A native sneaked up behind Namora and struck her with a war-club, then he carried the unconscious sea beauty to Derry--although he didn't know who she was, Derry ordered his men to bind Namora and throw her in the nearby river to drown. 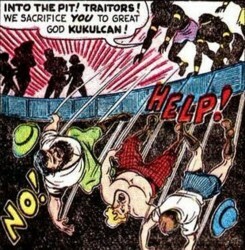 But Namora was revived by the waters of the river; she broke free from her bonds and made her way back to Dr. Webber's camp-site, where she saw Webber and his group being captured by the natives--since there were too many Mayans for Namora to tackle, she secretly followed them as they escorted their prisoners through the jungle. The captives were marched back to Apaco and brought before Derry; Webber demanded their release, but Derry only laughed heartily and promised Webber that they would get their "release" after he deceptively told the Mayans that Webber had come to prevent them from re-establishing their lost empire. Hours later, beneath the full moon, Namora watched as Webber and the other captives were led before a statue of Kukulcan. Derry implored the god-statue to render its judgement of the prisoners--the idol spoke and decreed that they were to be sacrificed. But before any action could be taken, Namora located a hidden staircase inside the back of the statue and raced upward; when she reached the statue's head, she found the "god's" voice was actually furnished by four Mayan allies of Derry. The natives below were about to cast Webber and his group into a sacrificial pit, so Namora pummeled the statue's operators, and it was Namora's voice that next spoke from the idol--she told the Mayans that Derry was their enemy because he had robbed their temples. 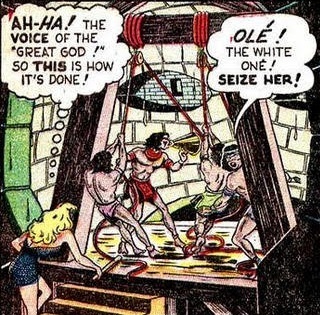 After finding the temples' altars stripped of the gold, and thus confirming that Namora's words were true, the enraged Mayans seized Derry and his henchmen and cast them into the pit. Alarmed by the natives' growing fervor as they next turned their anger towards Webber's expedition, Namora leaped from the mouth of the statue to the ground to put a stop to the sacrificial ritual before it went too far. Namora convinced the Mayans that they could not hope to regain the power of their lost empire, but they could instead regain their prestige by exploiting the wealth and knowledge that was theirs when the rest of the world was still in the Dark Ages. After hearing the great wisdom in the words Namora spoke, the Mayans agreed to release Webber and his group, but they insisted that Derry and his henchmen would remain in the city to work for them. The eventual fate of Jim Derry and his henchmen, and if they were ever released from their forced labor, remains unrevealed. It wasn't specified in what branch of science Derry specialized, but I'm guessing that it was archaeology. Two unidentified individuals, they assisted Jim Derry in his scheme to loot the treasures of the Mayan city of Apaco. The larger bare-chested man seemed to be "hired-muscle," while the smaller man seemed to inventory the stolen treasures. After Namora revealed that Derry and his henchmen were stealing their city's treasures, the Mayans kept the two henchmen and their boss as slaves. A lost city somewhere in the jungles of the Yucatan Peninsula, it was inhabited by an unspecified number of descendants of the Mayans. It had once been a fantastically rich and beautiful city, but it had fallen into ruins over the centuries. 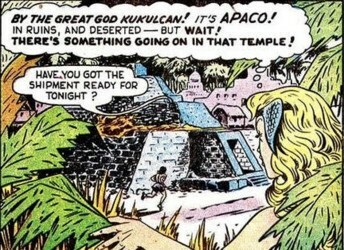 Some of the structures within Apaco included pyramid temples and a large statue of the god Kukulcan. The lost city was first discovered by an associate of Dr. Webber; later, Dr. Webber himself launched an expedition to find Apaco. Built in the image of the Mayan deity Kukulcan, it was situated by a sacrificial pit. The statue had a hidden internal spiral-staircase in back which led to a chamber inside its head. Within the head, four of Jim Derry's Mayan allies operated the statue to make it appear as though Kukulcan himself was speaking--while one Mayan used a megaphone to simulate the god's voice, two others operated a rope-pulley system to open and close the statue's mouth. Dr. Webber was an archeologist, June was his daughter, and Tom Bowen seemed to be Webber's assistant and/or June's boyfriend. 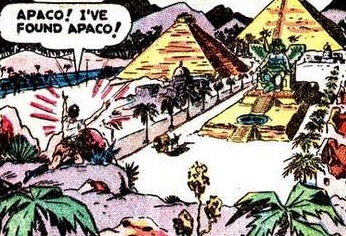 Months earlier, a fellow scientist and friend of Dr. Webber's had discovered Apaco, but he had died before he could reveal its exact location--having learned the general vicinity of where Apaco could be found, Dr. Webber began an expedition in search of the lost Mayan city. While in the jungles of the Yucatan Peninsula, Webber and his group encountered Namora when she saved them from a giant boa constrictor. 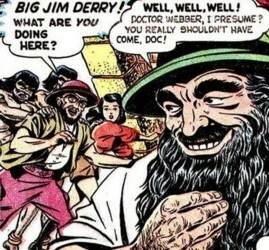 Later, after Jim Derry tricked the denizens of Apaco into believing that Webber's group was there trying to stop them from re-establishing their ancestral empire, the three were condemned to be sacrificed; but Namora again saved them and convinced the natives that Derry was stealing their treasures. Afterward, Namora assured Dr. Webber that the natives would be very willing to cooperate with him. As the trio thanked her and bid her farewell, Namora swam off and told them that perhaps they'd meet again in another part of the world.